This will serve as a preliminary post to an upcoming guest, Robert Dudzic. He will be featured in the next episode of the podcast but for now I have info on his new product. 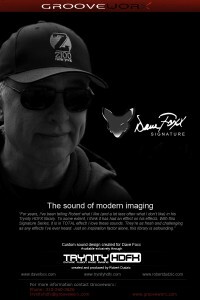 It is an expansion to his popular Trynity HDFX service through Grooveworx called the Dave Foxx Signature. You can visit Trynity’s Site for more info. I have personally been a fan of Robert’s work for years. He does a great job of creatively merging cutting edge sound fx and music to make unique branding tools for radio and other forms of media. You can hear the demo over at his site plus find contact info if you are interested in the product. They will give you a temporary login/password to check it out. At the very minimum I am confident producers will be inspired in their own production. But if you are lucky perhaps you will gain a great new product for your imaging arsenal.